Hard Rock quintet SLEARS was founded in Bavaria in 2007. They released a demo album in 2008, followed by the debut full-length “Far Away from Getting Somewhere” in 2014. 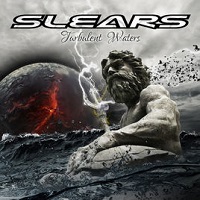 Their newest album here “Turbulent Waters” was released on March 23, 2018, and contains eleven tracks. Let’s get to some of the highlights on the album. “Anchors” is a short opening piece, talking about tides and the ocean. Vocal harmonies are high as it segues into “Freefall.” It has a meaty opening sound, with a heavy riff and a fast, energetic pace. The vocals are gritty and give the track some edge to it, but the big chorus is key to the track as a whole. The title track, “Turbulent Waters,” is a mid-tempo, blues based song with some low and deep guitar and bass chords and some vocal harmonies. Again they push a big chorus with a raucous energy followed by an adept guitar solo with prolific doses of wah-wah. “S.O.S” is back to a faster moving track with some emotive vocals, hearing Peter stretch out into some higher ranges in the chorus. The riff is chunky and heavy; bordering on the Metal genre at times. “Handful of Rain” opens with piano and clean guitar notes. It’s an introspective song that is sometimes slower and more tender, while at other times aggressive and lashing out. I’m still searching for who this band reminds me of most, but since I am coming up empty I put the question aside and just focus on the music. “Now we Run” opens with acoustical guitar and an alluring sound. It’s a ballad of sorts, or at the very least the softer side of the album. It spins a positive message about believing in yourself. “Angel Lost” is a shorter, three-minute track with a memorable opening riff and guitar work in general. You can hear the band reaching for greater heights in this song, which is heavy and melodic at the same time. “Ocean Eyes” closes the album. Here is what structurally sounds like a “power ballad,” where Peter’s vocals show great versatility. It’s a fitting ending for an album that has a lot of songs in the “water” theme. Water is an element that can be soft and moving, like sailing on calm waters or hearing the trickle of a stream over rocks in the forest. Water can also be a punishing force that can bring down mountains and level towns. These opposing positions are reflected well in the music on the album here in the sense that they cover both extremes…sometimes fast and aggressive while other times tender and introspective. Although they aren’t covering any new ground when it comes to a sound that you haven’t heard before, they are genuine in their approach and inject a good deal of personality into their music. Give “Turbulent Waters” some attention.